Hi friends! Hope that you are doing well. I'm doing so-so. I went to a GI specialist yesterday and this is the most hopeful I've been since I started getting sick. He was extremely nice, confident, and explained everything. He has some theories as to what's wrong with me (C Diff and IBS) and gave me some medicine. He said if I wasn't well in one week then I should call him directly and he gave me his office line (instead of the one for the front desk like most doctors.) So, I'm taking my medicines, had my blood tests, and hopefully I'll be better by next week. Here's a card I made for a call that wasn't picked up. My friend Virginia calls these cards "un-choosen" instead of rejects. 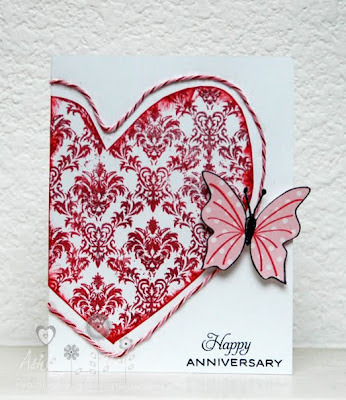 :D This card is made with WOW Embossing company stamps and Whisker Graphics Peppermint Divine Twine. The patterned paper is from Echo Park. Fingers crossed that you feel better soon Ashley :) This card is lovely - I especially love that butterfly.